Two of our team members will be getting very wet, even muddier and mentally challenged on 20th May. Chris Woods and Lee Hankins, (probably the two you would least expect), are taking on the challenge of Tough Mudder Midlands 2017 all in order to raise money for Lee’s young son Jack. Jack has experienced issues with his development since birth which affects everything from his walking to the things he can eat and the way he eats. 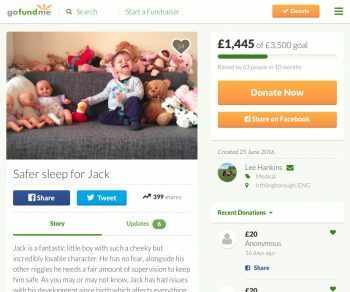 Jack’s sleeping habits are his latest challenge which has resulted in the need for Lee and his wife Donna to provide Jack with a specialist bed. Obviously these things come at a considerable cost so they have been raising money through kind donations via the GoFundMe website and as part of this effort Lee and Chris along with other friends and the team at Graphisoft UK are undertaking the Tough Mudder Midlands challenge to try and raise as much as possible to help towards the cost. So far over £1,400 of the £3,500 goal has been raised. More information relating to Jack’s condition and updates on his progress can be viewed using the link below where donations can also be made in support of Chris and Lee’s pending muddy experience. Watch out for further updates and the official photographs, and also video of the event in a future blog article.